The latest issue of The New Yorker includes a massive, 12-page profile of everybody's favorite Swedish-run, Dutch-owned nonprofit furniture retailer, IKEA. The story includes several fantastic factoids about the company, as culled by Curbed. For example, did you know IKEA is the world's third largest consumer of wood globally? Or that that different categories of products get different themes for names? (Curtains are named after mathematical concepts; bathroom products after lakes and river.) But the most important datum in Lauren Collins's investigative reportage clearly is this: IKEA beds are great for baby-making. According to the article, "It is said that one in ten Europeans is conceived in an IKEA bed." 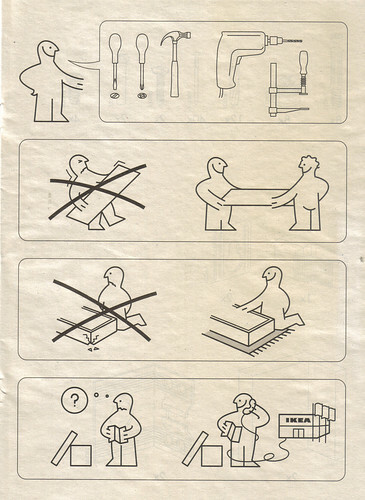 It's a statistic that's been floating around the discussion surrounding IKEA in the past. We'll just add this: Europeans clearly don't need the company's famed illustrated instruction booklets for that "assembly" project.